This is a re-post of an essay I wrote for the Lowy Institute earlier this month. Basically, Trump blew Hanoi, because he is lazy and poor negotiator. He has no empathy, so he cannot put himself in another’s shoes. Nor does he read, so he has no idea what the issues really are. He isn’t preparing for these meetings. He is throwing them together as he goes. So he walks into them unprepared with little fallback when he doesn’t get his way. Both Singapore and Hanoi failed along the same lines. Trump is 0-2, because he’s winging it. This is classic Trump of course and shows yet again how badly suited for the office he is. A normal president would have at least had staff hammer out some basic agreement beforehand so that acrimony was not the only outcome. But not Trump. Negotiating to him is laying down ultimatums and sounding off on Twitter. And the response is predictably: the North Koreans are upset at the snub and threatening to restart testing. For the life of me, I cannot understand the affection of Trump’s voters for such rank incompetence. He is so obviously in over his head, bungling a rare window of opportunity with NK, because he simply will not read, plan, or prepare like a normal professional. It’s amazing he hasn’t wandered into something genuinely catastrophic. 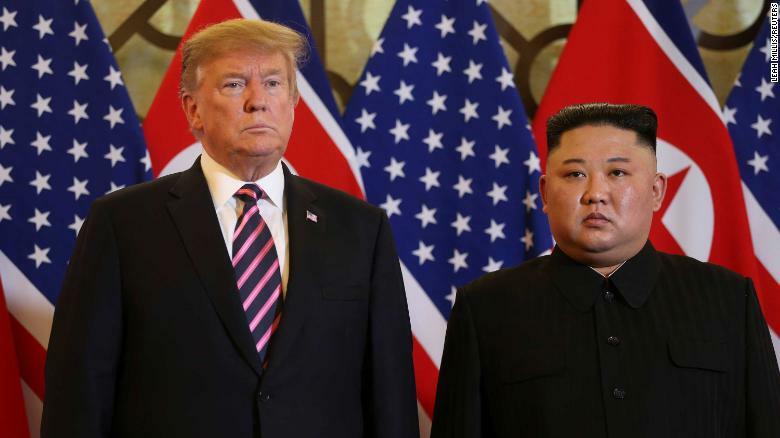 There is enormous uncertainty now about the failure of the summit in Hanoi between US President Donald Trump and North Korean supreme leader Kim Jong Un. There will be a natural rush by hawks and doves to frame this, respectively, as proof that North Korea is belligerent and overdemanding, or that Trump is inflexible. Both may well be true, but analysts should be careful. We just do not know enough yet; we are not even sure which leader pulled out first, despite Trump’s claim it was him. But if the ideological and policy fall-out is unclear now, one thing that is clear is that Trump’s thrown-together, fly-by-the-seat-of-his-pants diplomacy has reached the end of the road. This is an argument I have made for a year now, both on the Interpreter and on Twitter. So at the risk of belaboring the obvious, it should be pretty apparent now that Trump has whiffed twice in summits with Kim, almost certainly because of a lack of staff preparation and presidential commitment. The US and North Korea face a decades-old strategic and ideological divide. The issues are deep-rooted and genuine. North Korea is a terrifying country that treats its people barbarically. That is a powerful moral reason why so many countries hold it at arm’s length. The US also has a strategic interest in seeing South Korea hold its own against this orwellian state. The South Korean constitution does not recognize North Korea. The US has stood behind that for decades. In South Korea, Japan, and the US, there are many interest groups and actors with deep commitments – some of them ideological, many hawkish – on North Korea. So the status quo with the North is very deeply entrenched – for moral, ideological, strategic, and bureaucratic reasons. This bureaucratic resistance was fairly predictable, but Trump approached negotiating with North Korea as he has so many other major initiatives in his career – with a mix of bluster, laziness, and media over-exposure. As with reforming health care, building his wall, or pursuing an infrastructure build-out in the US, Trump showed once again regarding North Korea that he is just too slothful, impulsive, and disinterested in details to really do the work necessary for a major bureaucratic push. Revolutionizing US relations with North Korea may be possible, but it will take much effort. Trump needs to use the ‘bully pulpit’ of the presidency to sell this to the many skeptical parties concerned about North Korea. He has to try to bring these groups – US allies, Congress, the think-tanks and media, military elites – along and assuage their fears – that he is abandoning South Korea or Japan, that is ignoring human rights and abductees, that he is bending on North Korea to get a deal from China, and so on. This might be doable – I am not actually sure myself – but something this big requires sustained, serious, public presidential leadership. And Trump just cannot do that. He is just too checked-out from his own presidency. He is too lazy, most obviously. He goes to work late, watches too much TV, does not listen to briefings, does not read, and so on. In the two years he has spoken about North Korea as president, there has been no perceptible improvement in his grasp of the issues. He is still grossly uninformed about Korea, nuclear weapons, and missile technology, and so wildly unqualified to go one-on-one with Kim Jong Un. Staff work would presumably fill in these gaps in presidential leadership, but here too Trump has undercut his efforts by throwing these summits together in just a few weeks. Given how deep, serious, and complex the issues between Pyongyang and Washington are, it would be a remarkable bureaucratic feat if the relevant staff work could be done in a month – which is the time Trump gave his team before both the Singapore and Hanoi summits. Previous efforts to engage North Korea involved months of planning (the Agreed Framework, the Six Party Talks), while the Camp David Accords, which brokered peace between Israel and Egypt, benefitted from years of rethinking by all parties and serious, committed, focused US presidential leadership. If Trump really wants something big like that between the US and North Korea (so he can win a Nobel Peace Prize, which he apparently really wants), he needs to make a much greater effort, really learn about these issues in order to speak of them in at least some level of convincing detail, and lead a major presidential, cross-party, cross-ally bureaucratic and public relations push. He has not done that, relying instead on his supposed chemistry with Kim Jong Un and South Korean President Moon Jae In. As should now be clear, that is woefully insufficient. It is now apparent that Trump will not mature into the presidency and acquire these skills. Hence the next step should be to kick negotiation with North Korea down to the staff level at the State Department. Let the diplomats and technicians hammer out some small, workable trades with the North Koreans to build some basic confidence all around. Otherwise, a third summit with Kim will founder just as the last two did. Presidential whimsy and lust for recognition is not enough. In a normal presidency, the preparation for a further summit would see Trump learn the issues at least somewhat, work up a few trades with North Korea (aid for missiles, for example) which will enjoy some kind of consensus among the many interested parties, and then give some major programmatic speeches laying arguments for these deals with North Korea in the context of why a dramatically changed relationship with North Korea is a good idea. This is actually doable. US presidents launch major initiatives like this all the time – George W. Bush’s war on terror, or Barack Obama’s push to expand health care come to mind. But Trump is just too lazy and disinterested, relying instead on these thrown-together-at-the-last-minute summits. They have now pretty obviously failed. This entry was posted in Arms Control, Diplomacy, Korea (North), Lowy Institute, Nuclear Weapons, Trump by Robert E Kelly. Bookmark the permalink. Trump is an idiot. A true idiot. He is no statesman, just a sexual impotent little man.